While there are many roadblocks and threats that prevent or obstruct the selling and buying of your B2B product or service, there tends to be one fundamental weakness in just about any sales organization. The flaw is often with the existing sales process itself. We’re talking about the process through which Marketing Qualified Leads (MQLs) becomes Sales Qualified Leads (SQLs), Prospects, Opportunities, and finally a new Customer. Now, for the sake of your own revenue and profit, your sales reps and team should only be handling MQLs, and never run around prospecting or trying to conjure MQLs out of thin air. You probably have a sales process for you how you sell your product or service, right? Again, you probably have your own version of this but the principles are the same. There’s nothing wrong with this. In fact, you’ll hold on to your process throughout this, with some changes. Who’s On The Other Side Of The Table? But the issue is that it fails to account for “the other side of the table”, and the most important person involved, namely: your customer. 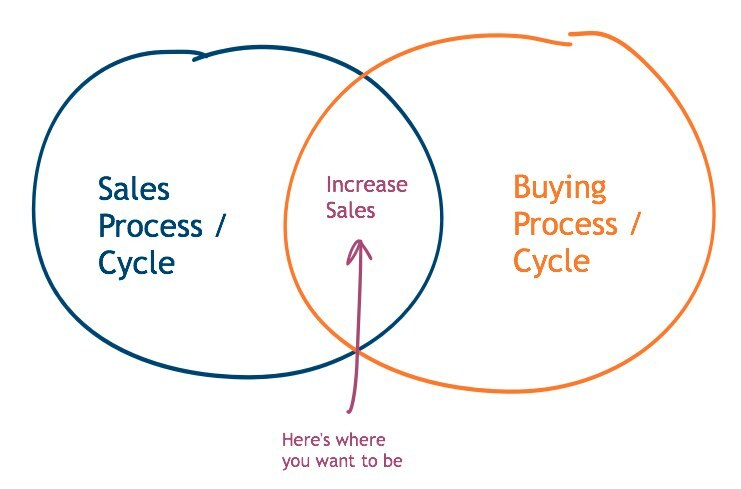 Your customers and buyers have their own process and cycle they go through. And they don’t care what “step” or “phase” they’re on, according to your pretty flowchart. They’ll act according to their own sense of what they need, what they’re exposed to, what decisions need to be made, who their boss is and what said boss wants, budget for the fiscal year, implementation and roll-out challenges, and more factors that you’ve probably never heard of. Just to give you the light at the end of the tunnel: understanding and mapping these buyer criteria, factors, and variables – and aligning your sales process with it, is the most important strategy you can deploy. Selling your B2B product or service to Enterprise, Fortune 5000, and other large, mid, and small-sized companies comes with a veritable smorgasbord of challenges and aspects. And your competitors and you are all trying to stick your forks into the same piece of ham. The degree of alignment your sales process has with your customer’s buying process will directly affect sales, revenue acceleration, cost of sales, and growth. Let’s get a grip on reality, then, shall we? Status Quo: Your buyer might just decide to do nothing, because making a change always require action and movement, and it’s always easier to do precisely nothing; “if it ain’t broke, don’t fix it”. Approval Process: Often, several internal parties will need to be included and have to approve any purchase. They’re asking if your software is within budget range, will add value, be justified by the return, and more. Financial Liability: Software and software licensing tends to run a pretty penny in the B2B space, so you can count on free trials, demos, and extensive research before a decision is made. Also, you may or may not be a vendor for which there’s funding for – and that’s often decided without you knowing about it. Comparison Shopping: Your potential buyer is comparing you to at least 3-4 competitors (yes, you have them), and doing so down the wire (a deal isn’t won until money’s in the bank). These are just less than a handful, but some more common, factors and challenges you, and your buyers, are facing. In addition to all that, there’s also a fairly standard Purchasing Process that happens, too. Now, this is a bit of a unicorn, but it happens: A potential customer finds you first, and they’re actively looking for software like yours that they can spend money on. But if you rely on opportunities like these to materialize themselves, you’ll be shutting the doors to your company in no time and go out of business. Step 1 – Someone needs your product or service: They discover a need, either on their own or in conjunction with team planning and discussions. They might’ve been tasked to find software for a project or to spearhead a new initiative, or what have you. But at a certain point, they’ll ask their Purchasing Agent for it. Step 2 – The Purchasing Agent goes looking for a software solution: They’ll look all over the place (Google, websites, whitepapers, trade shows, list of vendors, etc.) for a list of possible candidates. Step 3 – Purchasing Agent makes contact and sends out material: You’ll get a list of questions, perhaps a spreadsheet with a list of requirements, and they’re looking to see if your software fits their needs. Step 4 – Purchasing Agent requests a presentation, demo, and/or quote: If you pass the previous test, and you’re still in the running with your other competitors, you’ll either make a presentation, show a demo, and/or provide a quote. Step 5 – You win! A Purchase Order is generated: Let’s pretend you end up being the lucky winner in this lottery, and you get a PO. It’s just a formal document that outlines payment terms and deliverables, etc. Step 6 – You deliver the software: Pretty straight-forward; perhaps you also assist in any rollout or implementation. Step 7 – Accounts payable pays your company: You receive the payment. All done. So far, so good, yes? The issue is that this scenario is a bit of unicorn, but the individual parts are true and will happen to you in any given sales process. And if you’re aware of them, and can decode it all, you can also take charge of it. As for actually figuring out the Buying Process itself, that your potential customer is following, is the next step toward more sales. If you can get a good enough handle on this, you can “hack” the buying and actual purchasing process, shortening the whole cycle, and probably end with a lower cost of sales and higher probability of winning new deals. You’re looking for alignment – not with every possible sales scenario, but the ideal customer and their buying cycle. Yes, that probably means you need to talk to your customers and mine them for insights and clarity. I’m not one to decline data and metrics and for sales intelligence I prefer to start out with more than enough, and cut down to what’s needed. For you, there are three categories that you absolutely need to know in order to map your customers buying cycle. You can add more data points and categories later. That’s it for now, and even just implementing this knowledge in your sales organization can have a meaningful impact on your sales relatively quickly. Let’s define them a bit, however. Buying Behavior: This would be the behavior of your buyer, which changes over time, in response to what’s happening, and in what phase of the buying process they are. In general, you’re looking at: Opinion forming, Research & shortlist, Action, Buying, Renewal / Repurchase. Buying Accelerators: These are just what it sounds like, accelerators for moving forward in the process. They’re similar to conversions, but forms the motivators, stimulus, and incentives to taking the next step. By decoding what they are for your ideal customer, and infusing your sales process with them, you’re able to speed things up. Buying Friction Points: Pretty straightforward, like above, these are points of friction, deterrents, and roadblocks that prevent or slow down the buying process. They’re a more intelligent form of objections, and by knowing what they tend to be ahead of time, you can do a lot of prevention in your sales materials, presentations, or demos. Replace the example above with your scenario, and it’s starting to make a whole lot more sense now, isn’t it? …Well, you’re halfway there to taking charge of your customer’s buying cycle. In B2B sales, a competitive advantage is perhaps more critical than anything else. You’ve probably been told that your product needs to be, have, or give you this. This is certainly true, but in terms of engineering and development, the constraint is not developing a good product. The constraint is developing, systematizing, and scaling your sales. If you’re a B2B company with a range of $2 – $5 million in revenue, but you want to scale to $15, $20 million and beyond – decoding and taking charge of your customers buying cycle is critical. If you’re a B2B company with less than $2 million in revenue, you still need to get a grip on this, but you’re looking at spending more resources on decoding first. With that in mind, the first model to implement for decoding and taking charge of your customers buying cycle is the classic OODA Loop. There are several frameworks and cognitive models that can be used, but this is the most fundamental and many others derive from it. This looks complex, but you’re not looking to exactly replicate this – only develop a working model for when you’re in the middle of a sales process and buying cycle. While the original OODA Loop was formed in the crucible of war, and aimed at creating confusion, obscure intentions, and general mayhem, you’re clearly not looking to do the same in a selling scenario. Observe behavior and the “landscape” of who you’re selling to. There are probably multiple stakeholders, an economic buyer, advocate, mobilizer, and so on. Are they looking to buy now or in the future? Is the budget where it needs to be? How much do they know about their own situation and what they want to solve, as well as how to solve it? The feedback loop is focused on taking inventory, forming Ideal Customer Profiles, Buyer Personas, etc. Orientation is the most important phase, since it shapes the way we observer, decide, and act. For a business scenario, you want to understand the business culture, previous experience, any knowable agenda (some are hidden), desired outcomes, etc. Feedback here is about segmentation of profiles, personas and adjusting existing information. Deciding is simply where you form a functional hypothesis on what to do next to move the sale and buying process forward. The feedback you’re looking for mostly centered around taking inventory of past and current hypotheses; data tracking, if you will. Acting on this decision, you’re doing what it takes to move the sales process forward in a manner where you’re allowing your potential buyer to feel like they’re making the decision and taking action – the action you want them to take. If your Decision and Acting phase feels like throwing spaghetti against the wall to see what sticks, then you’re doing Observation and Orientation wrong. Another key point to remember: You can only develop your own OODA and set of “hacks” as you’re going about selling. You cannot do this “in the lab”. You can only do this in “real time”. That means keeping your head cool in the midst of a buying cycle, and allowing for periods of reflection and formulating what you learn into ideas that can be used again, in future scenarios. I’m going to give you a bunch of ideas you can use as a starting point for taking charge of the buying cycle. But for the sake of your organization, there needs to be a process in place where you’re gathering and categorizing feedback. This is the raw material for a “playbook”. Think of these as a list of “plays”, which is a mixture of concepts, strategies, and tactics. Your buyer hates being sold to, and probably dislikes the entire buying cycle. They want it to be over fairly quickly (smooth), without too much hassle (frictions, distractions). Making it easy to buy, and avoiding an overly forceful approach, yet with a guiding hand, is how you want to proceed. If you can be perceived as “on their side” (and you should be on their side), and working to make their life easier, they’ll want to reciprocate. Your buyer’s job might even depend on this purchase and your product. This is a prime motivation to tap into and use as part of your sales conversations. If they believe they’ll “look good” in some fashion, you’ve increased your odds of selling. A boss probably assigned this task and project to your buyer, so your buyer probably needs help “selling” your software to a manager, committee, or some other combination. Allying with this person is a classic tactic, but more than that, you need to also figure out who’s the mobilizer and person of influence. It may or may not be whom you’re talking to. Your buyer probably has an upper limit of expenses he or she can approve on their own authority, without having to go through a labor-intensive process (a corporate credit card with, say, a $1,000 or $5,000, etc. spending limit). Can you offer monthly billing that fits within that, or a “light” version of your software within the spending limit? It’s not their money, but they’re probably accountable for it. To a certain degree, they won’t have the same internal limit to spending money, since it’s not technically theirs, but if all fails, they’ll be held accountable for what they’ve purchased. Alleviate this concern. Have them self-diagnose, but then don’t believe them. You can often ask someone things like “on a scale of 1 to 10, how likely are you to [take your desired action]?”. Whatever answer they give is probably not entirely accurate, but that’s okay – you’re only looking for a range. Anything between 6-8 and you need to escalate more; less than 6 and it’s either long-term nurturing or disengage; above 8? Close this within 2 weeks or less. Sales is more about timing than art or science. Using the right message, at the right time, to the right person will do more than a few weeks of meetings, discussions, questions, etc. Remember the Observe and Orient? Yeah, always keep your potential buyer front-and-center, and align with their time. “Small hinges swing big doors”. Don’t focus too much on quantity of activity, but hone in on the quality. Taking control of a demo presentation within the first 2 minutes will do more than your 10,000 word ebook. Then again, that same ebook can do more to qualify a MQL before you waste time with a demo presentation. Look for leverage points in every phase. Alignment comes first, but then you need to gently take control of the wheel. Don’t get sucked into their timeframe and behavior and stay there; align yourself with it, show yourself to be an ally and trusted advisor, and then move it along to where you want it to go. Persistence beats persuasion. A general rule of thumb would be that anything more than 9 touches, and you’ll see diminishing returns. But are you even doing your classic 5 touches? Probably not. Systematize a process of follow-ups, with a timeframe, and then either abandon ship or put on long-term nurture. Never settle for “maybe”, always go for “yes” or “no”. Have your MQL and SQL “buy” into the process itself. Once aligned, set common goals and timelines. 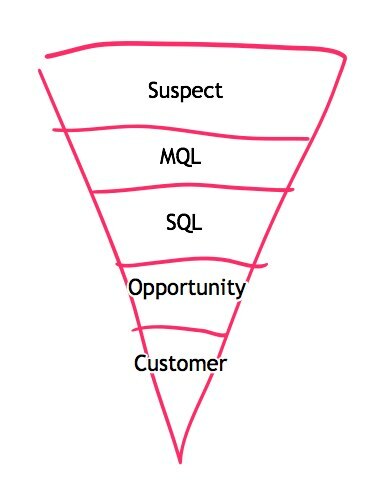 Basically, you’re collaborating on how your SQL want to be sold to; they’ll tell you between the lines so pay attention. Nothing beats eliciting their buying values, and you being able to partially define those for them. Polarize by comparing and contrasting. If you’re bland and general in your messaging (verbal, text, whatever), you’ll lose the deal every time. Consider the big problem your software is solving, the universal state of affairs you’re improving, and the recipient of your solution – formulate messaging with this but take a stand with it. You’re effectually taking charge here (of the buying cycle), by increasing your sphere of providing the definitions. If you define and frame the conversation, you own the conversation. Mitigating risk for them. A purchase decision always carries risk with it. Your buyers want to be sure they’re making the right decision. Certainty eliminates doubt, removing obstacles confirms your authority, and direction establishes leadership. This is your starter list – but your sales team needs to develop your own sets of plays. At the very core of what you’re doing, it’s a game of truth. The “moment of truth” is when your prospects makes a purchase. You win “the game” when that happens. Everything up to that point is a game of decoding your prospects buying behavior (Observation, Orientation) and taking charge of it (Decision, Action). In other words, your competitive advantage is knowing your potential customers better than they know themselves. Effectual and increased sales for B2B product or service companies happen when your sales team are utilizing these models “in the trenches”, and making iterations as you go.